Since 2010, Paul McCartney’s back catalog has been undergoing a slow, painstaking revamping that has resulted in four deluxe reissues. It hasn’t been chronological, but the choices have been logical. Band on the Run (1973), hailed by many as the crown jewel in McCartney’s discography, was the first to be reissued. Rather than simply go back to the beginning, his solo debut McCartney (1970) was paired with its similarly DIY sequel, McCartney II (1980). Last year, around this time, we got a massive box set version of his second album, RAM (1971). On May 28, fans will be treated to a celebration of all things Wings with the live album extravaganza, Wings Over America (1976). It makes sense when you think about it. Over America contains 28 songs, the majority of which being McCartney’s ‘70s hits and album tracks. Unlike all his tours since 1989, the 1976 tour saw McCartney delving into his Beatles’ past very selectively. We get a jaunty run through “Lady Madonna,” a tasteful “The Long and Winding Road,” a countrified “I’ve Just Seen a Face,” and deeply felt solo performances of “Blackbird” and “Yesterday.” Band mate Denny Laine, who played mostly rhythm guitar but doubled on bass and keys as needed, was allowed a bit of nostalgia of his own, singing his Moody Blues golden oldie, “Go Now.” In perhaps the strangest inclusion, Laine also takes a stab at Paul Simon’s “Richard Cory.” Otherwise it’s Wings in all their tuneful, energetically rocking glory. It’s easily the most essential McCartney live album (the only other one that comes close is Unplugged), even if you find yourself tempted to skip the non-McCartney tracks, such as lead guitarist Jimmy McCulloch’s “Medicine Jar.” McCartney’s ill-advised desire to present Wings as a “real band,” rather than a group of backing musicians, rears its head several times. These don’t really ever qualify as bad moments, however, and Denny Laine’s “Time to Hide” is one of the best non-McCartney tracks in the entire Wings oeuvre. Over America, truth be told, doesn’t sound revelatory after remastering when compared to the previous CD. The new edition accurately presents the sound of the original recording. The Archive Collection releases aren’t being remixed, just remastered. So far it seems great care has gone into avoiding over-compression. While there is a perceptible increase in loudness, Over America still sounds warm, natural, and there is no problem with clipping. A third disc containing eight bonus cuts from a performance at San Francisco’s Cow Palace will be included with the full deluxe version. It wasn’t part of my advance copy, so I haven’t heard them yet (see below for a way to get this disc without springing for the full box set). 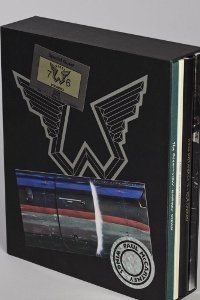 A DVD of the television special Wings Over the World is also included only as part of the deluxe box set. This special, which originally aired in 1979, is far from essential considering it’s mostly made up of concert clips from the Rockshow film. Performances from several ’76 shows were compiled for a feature-length concert film, released in 1980 as Rockshow. This film has been fully restored and will be available on DVD and Blu-ray June 11, which renders Wings Over the World kind of useless. In between the performance footage, there are short documentary segments. Some of these are fun for fans, including McCartney, wife Linda, and their entourage crowded around a tiny TV to watch a news story about the tour. There’s a little soundcheck footage and some older bits, including a snippet of the initial 1971 Wings’ lineup jamming on “Lucille” during their first rehearsal. But Rockshow will make most of the 73-minute special redundant, so this DVD is probably for completists only. There’s also an eight-minute piece called “Photographer’s Pass,” which is basically a slideshow of photos taken at various stops throughout the tour. Also not included in my advance copy are the wealth of print materials that will be part of the full box set. I’ve described some of that material here, but suffice it to say there are four books full of material documenting the ultra-successful ’76 tour. All of this carries a steep price tag, with Amazon currently asking $138.99 (the price has fluctuated since it first went up for pre-order, with some lucky customers locking in at just under $100). If it’s all a little too rich for your blood, consider this: Best Buy will be carrying an exclusive three-CD configuration. That’s the standard two-disc album plus the eight-song bonus disc (normally only available in the deluxe set). I suspect that for many fans this version, coupled with Eagle Rock Entertainment’s upcoming standalone Rockshow release, will be a satisfactory alternative to the full deluxe set. I’m going to see Paul McCartney for the first time in a few weeks. Thanks for the information about Wings, I’ve always thought they were under rated. Nice! I’ll be seeing McCartney in concert this summer too – he always puts on an incredible show, I’m sure you’ll enjoy it.